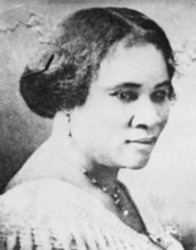 Madame CJ Walker (1867-1919), born Sarah Breedlove McWilliams Walker, is generally credited with being the first Black woman to become a millionare and the first self-made female millionare in the United States , around 1910. It is not clear whether this honor belongs to Annie Turbo Malone. Both women became rich producing hair care products with Walker credited with inventing the modern hot comb.